After many amendment proposals and hours of debate, the Senate passed the Maryland Healthy Working Families Act by a vote of 29-18. While Governor Hogan has indicated that he will veto the bill when it reaches his desk, both chambers of the General Assembly have secured veto-proof majorities for their respective versions of the bill. What remains to be seen is what further modifications will be made to each bill as SB 230 and HB 1 (the House cross-file) make their way through opposite chamber hearings. The bill, which would reauthorize the Community Eligibility Provision (CEP) of the Hunger-Free Schools Act of 2015, was heard in the Senate Budget & Taxation Committee, while its cross-file (SB 361) was heard simultaneously in the House Ways and Means Committee. Family League has been a strong supporter of this bill, testifying in both committees, and co-authoring an op-ed with several of our coalition partners in the Baltimore Partnership to End Childhood Hunger. A Senate bill that will allow youth who graduated high school before they turned 18 (and were either classified as foster care recipients or unaccompanied homeless youth at the time) to join their peers who graduated after they turned 18 in receiving tuition waivers was heard by members of the House Ways and Means Committee. The bill, which would repeal the year-long waiting period currently required to reinstate food and cash assistance benefits to nonviolent felony drug offenders after they’ve served their sentence, passed the House by a vote of 83-52, and will be heard in the Senate Finance Committee. After passing the House with a 118-15 vote, a bill that would require the Department of Housing and Community Development to provide low-interest loans to projects and businesses addressing a lack of access to fresh, healthy food in defined food deserts across the state, will be heard in the Senate Finance Committee this Thursday. 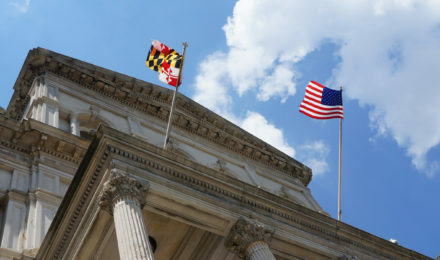 The Senate will hear a bill to allow for the formation of a Commission on the School-to-Prison Pipeline and Restorative Practices, which will examine current disciplinary practices in Maryland public schools and examine national best practices for training teachers and principals in restorative practices and eliminating the school-to-prison pipeline. The Commission will report its findings and recommendations to the Governor and the General Assembly in advance of the 2019 Legislative Session. Governor Larry Hogan and budget leaders in the General Assembly reached an agreement that will assist Baltimore City Public Schools in addressing the $130 million shortfall outlined by City Schools CEO Dr. Sonja Santelises in January. The Governor’s supplemental budget will offer $28 million to Baltimore and 10 other school districts where student enrollment has declined, of which City Schools will receive $23.7 million. Additional details will be provided when Mayor Pugh releases her budget at the Board of Estimates meeting at City Hall on March 29 at 9am. For more information on the Governor’s proposal, click here and for more information on the Board of Estimates meeting, click here. On Thursday, March 30, the newly constituted Community School Steering Committee will hold its first meeting. Co-chaired by Family League and City Schools, with support from the Mayor’s Office, the Committee is composed of a cross-section of community stakeholders, parents, school staff, youth, funders, advocates, and policy makers who will oversee the progress, effectiveness, and evaluation of Community Schools. The CSSC will also work on developing school partners and resolving conflicts.